So much to discuss, too little space on the blog. I know. I know. I need to do a full Street$marts which I promise to bang out shortly. First, Fed statement day actually worked out okay as the market stayed in a tight range as forecast until 2pm and then rallied modestly into the close. Not a huge winner, but a win is a win and it kept the almost 80% accuracy rate going. Apple is now a trillion dollar company. I am sure you couldn’t find that news anywhere! With all of the positive press, it’s getting to the point of being so good, it’s actually bad. That’s the exact opposite of gold which I have been discussing. Stocks have been acting better than I thought this week, especially after a moderately down opening on Thursday. While the Dow Industrials didn’t set the world on fire, the NASDAQ 100 and Russell 2000 certainly did. The former rallied 2% from open to close, which is a huge move in low volatility environment. Apple, Facebook and Amazon had a lot to do with that. Market-wise, the bulls made more progress than I thought and they have the ball for now although I still do not believe we have seen the low point for the pullback. Unless all five indices close above their July peaks, I do think the lows for this week will be breached sooner than later. When stocks are in decline, there is an historical trend after a down Monday for stocks to reverse on Tuesday. As the theory goes, sellers hit the market on Thursday, try to rally on Friday which ultimately fails and then spend the weekend reading negative press about the market. On Monday, there is more selling to get the last seller completed. From there, some kind of bounce or real rally begins on Tuesday. While the rationale is a bit shaky, the price behavior is not. 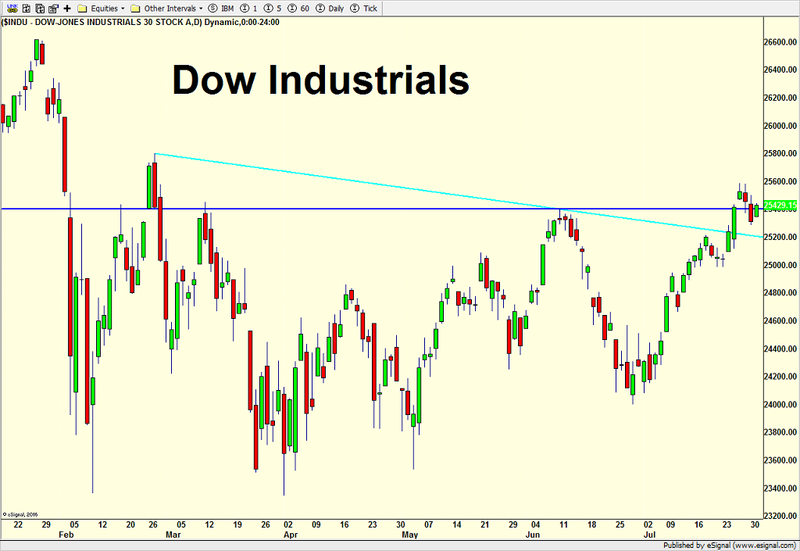 Adding to the idea of a bounce on Tuesday, the bulls could argue that the Dow Industrials have declined back in to the area from which they broke out from, namely the highs from June as you can see from the dark blue line below. I would be hard pressed to call a three day decline a significant or real decline for a Turnaround Tuesday to get even be realistic. Additionally, the Dow is the only index which has declined to a previously important price area. The other four major stock market indices have not so far, and therefore there isn’t much support for the Dow. Stocks have been under mild pressure, especially in the tech sector, but this is nothing more than a light bout of weakness so far. While we could see a bounce on Tuesday, I do not believe the selling is over. In the strongest rallies, a few days down is all the bears get to celebrate. Closing below Monday’s low will be an important sign that more weakness is forthcoming. Of course, if stocks run straight back to new highs and go, then I will be very wrong and adjust accordingly. FYI, Apple reports earnings after the close and that is almost certainly going to move the NASDAQ 100 significantly overnight and tomorrow morning. Keep an eye on gold. Keep an eye on gold. Just over a week ago and one day after most of the major market indices peaked, I posted a piece entitled Reigning in Bullishness where for the first time since the rally began in February, I tempered my enthusiasm. I couched my negative comments with more sanguine words that I absolutely do not believe the bull market has topped. 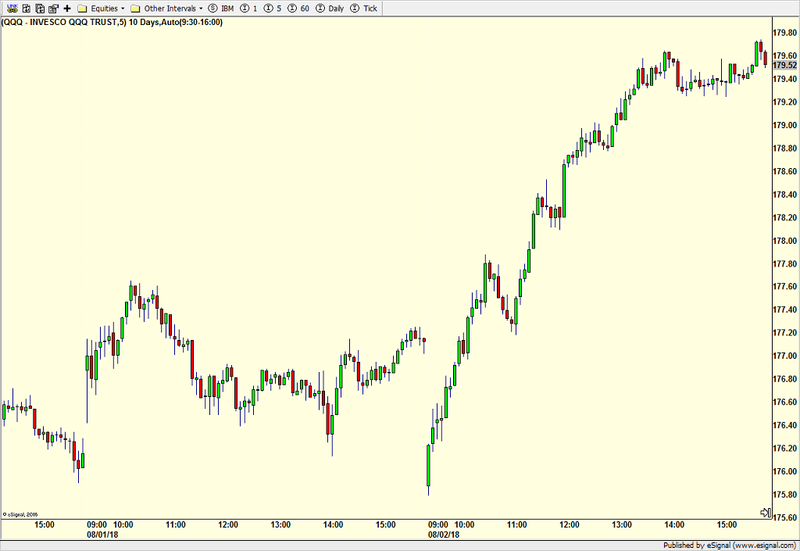 This looks like a routine, normal and healthy pullback, but also the deepest decline since the rally began. It’s been a crazy week with the Fed not raising and not really changing their stance, Apple’s earnings disaster and the Bank of Japan standing pat. As a side note, whenever Apple has problems, it’s amazing how many people come to its defense. When I am critical of the company which I most recently was on CNBC, Has Apple turned rotten, people act as if I attacked them personally. I love the amateurs who think they know more about the company than everyone else. You just have to laugh. Of note, famous activist hedge fund investor, Carl Icahn, publicly disclosed yesterday that he sold all of his Apple stock though he still supports Donald Trump. This was the same Icahn who pounded the table for months and quarters about how wonderful the company was and his bromance with management. Now, citing China concerns, he sells all of his stock as if the entire game changed in his mind overnight. I guess Carl couldn’t Make Apple Great Again! Anyway, getting back to business today is also month end where we can sometimes see portfolio games. The NASDAQ 100 is now down five straight days which usually means a bounce is coming. Sector leadership remains constructive with the defense groups, staples, utilities and REITs under pressure. Healthcare and biotech are head shakers as they finally got into a leadership position after several quarters of faltering, only to roll over again this week. Unless high yield bonds roll over and begin to underperform, I remain in the camp that we will see a buying opportunity sometime in May. For now, junk bonds remain long and strong. Earlier this week, Apple released a very solid earnings report beating analysts estimates on the top and bottom line, meaning the company had more revenue and profits than forecast. On the surface that should be a good thing and intuitively, you would think a boon to the stock. 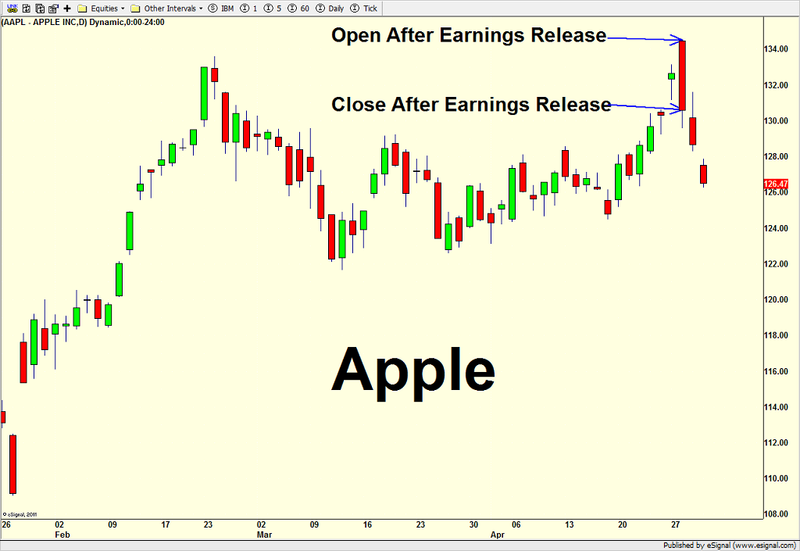 Apple opened at fresh all-time highs on Tuesday only to sell off immediately and close in the lower end of its daily range. Data miners have uncovered a solid trend that when the NASDAQ 100 is at or near new yearly highs when Apple reports, it becomes a selling opportunity for both the stock and NASDAQ 100 index over the short-term. This further supports what I have written about for several weeks that the short-term is somewhat murky for stocks, but the intermediate and long-term remain solid. Rolling Over or Revving Up? Last week, I wrote about how stocks were looking a bit tired and in need of a rest. Nothing has changed since that piece. The lagging blue chip indices like the Dow and S&P 500 reached higher while the leadership indices like the S&P 400 Mid Cap, Russell 2000 Small Cap and Nasdaq 100 have moved sideways. This is all healthy, routine and constructive behavior that should not lead to anything more than a trading pullback worst case scenario. Market internals, sentiment and leadership remain in good shape for the aging bull market to last at least into the New Year. There are two major market events this week. 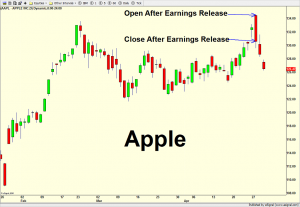 Apple’s earnings will be reported on Monday at 4:30pm and the market is expecting some good news judging by the recent surge to $531. The Federal Reserve Open Market Committee has a two day meeting that ends on Wednesday with the 2pm announcement. Analysts will be parsing through every single word for hints of the impending taper which is not expected now. With Janet Yellen, my original pick to succeed Ben Bernanke, soon to be confirmed and sharing similar dovish views to Bernanke, it would be very appropriate for the Fed to wait until her first meeting next year to begin the tapering process. You already know my opinion on the taper so I won’t rehash my entire argument other than to reiterate that I do not believe the stock market or economy can stand on its own two feet without the Fed’s help.